← Since we started our Gap Year we keep having amazing coincidences- Can someone please explain it to me? It has been over a month since I came to France to join Adrian on this wonderful adventure. Yes I was apprehensive, but it has being great. I flew into Beauvais Airport and then drove in a hired car to meet Adrian and the Dover Delivery crew in Douai. Then I had five days rest, which I needed before we headed off. On our first day of real canal travel, we ended up doing 17 locks! A real baptism of fire. What do I mean, when I say ‘doing 17 locks’? 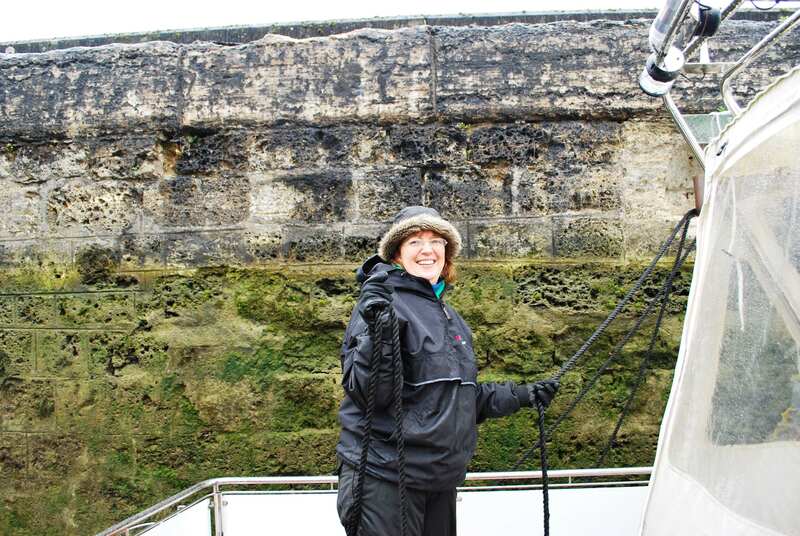 For those of you who don’t know, when the boat comes into a lock, I (as a member of the crew) have to secure the boat with ropes around bollards so that the boat can rise or fall as the water level changes and at the same time ensuring that the boat does not hit the canal walls. 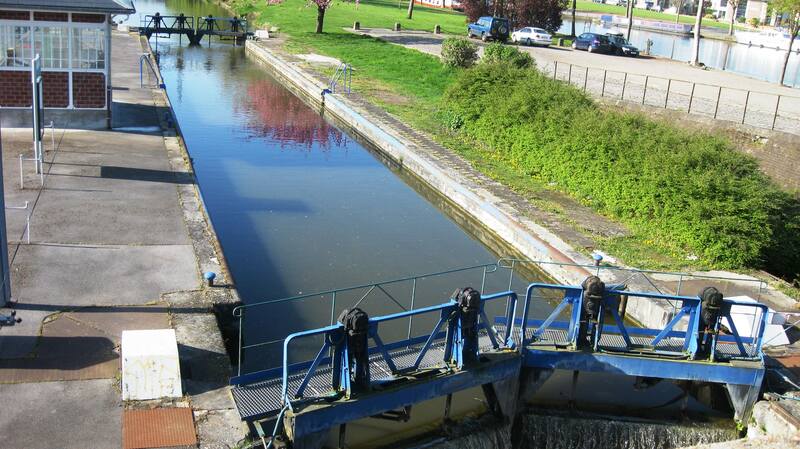 Locks are on all canal systems to allow for changes in height of the canal as it crosses the countryside. As we were going upstream, the bollards were all above my head so needless to say, by the end of the day, my arms were sore from throwing ropes (as I missed lots of times at the beginning until I learned how it was done) . I was worn out in effort to keep the boat away from the lock walls, but it was great exercise and beats going to the gym any day! I have to say I am really enjoying this lifestyle. Particularly Paris, as we were there for ten days. Guess What? I am even starting to cook and liking it! Wonders will never cease. Also cleaning up! For example I washed the boat windows yesterday. I cannot remember the last time I cleaned windows and enjoyed it. Sure who wouldn’t, on a lovely sunny day in the centre of France? I will give you more insights to my life on C’est La Vie next week…..
Adrian’s Note: Murphy’s Law works again. The lads and I had been doing 40- 50 km a day so I thought I was giving Nuala a first easy day by going from Douai to Cambrai. What I did not appreciate was, as we were moving onto the Saint Quentin Canal, it’s a much smaller canal than the Main Canal Du Nord which we had been on until then. Also as the Canal Du Nord was shut for repairs, all the commercial barges had to use this old narrow canal. The locks were narrow. You had to work them yourself and we had long delays as we had to give priority to the commercial traffic. It took nine hours to do the distance that I had previously done in four. A real learning experience for Nuala and I. When we got to Cambrai Nuala was exhausted. I took one look at her and said “don’t worry about the cost, ring your Mother!” She spent a half hour on the phone to her mother (God bless Aine) had a good moan and then she was fine. 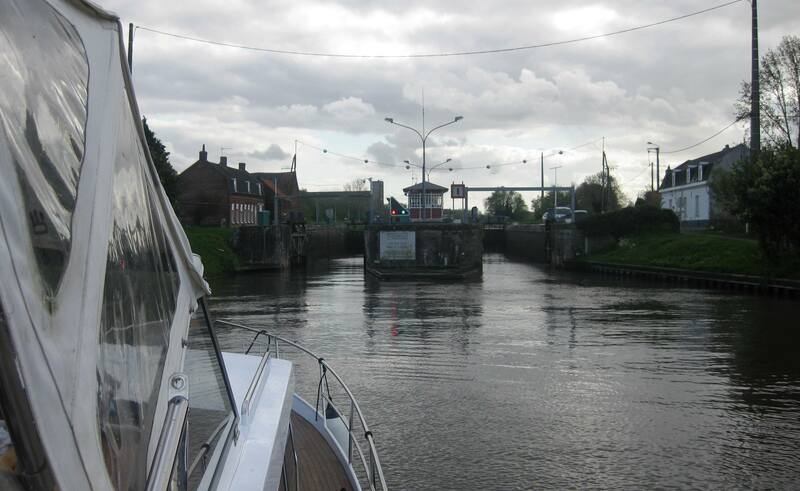 This entry was posted in C'est La Vie - The Boat, Experiences on the Canals, On the Journey and tagged Beauvais Airport, Cambrai, canal system france, Douai, Main Canal Du Nord, Saint Quentin Canal. Bookmark the permalink.